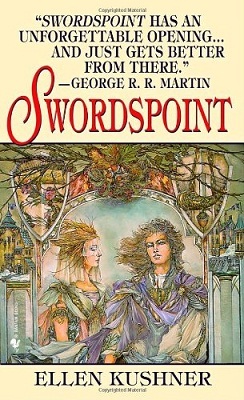 Swordspoint is another favorite fantasy novel of mine from the 80’s, although I read it much later. While it’s definitely secondary-world fantasy, set in an invented world, it features no magic. But it doesn’t need it. Swordspoint, described by the author as a “melodrama of manners,” is the story of the lords and dukes and and duchesses up on the hill who hire killers from the slums to settle their petty quarrels. Our protagonists are Richard St Vier, the finest swordsman in the city, who is routinely contracted by the nobles to duel for them, and his mysterious lover Alec. Yes, this novel features a gay romance. The roughly Regency-era time period feels appropriate for this book because it’s a decadent time period for the nobility, with carriages and parties and fancy dresses contrasting with bleak conditions in the slums, and in Swordspoint we spend time in both places. This is the era for dueling with swords as a way of settling disputes of honor, and such duels are a feature of this book. Further, the choice of this era allows the author to riff on the tropes of Regency romances and turn them on their heads. 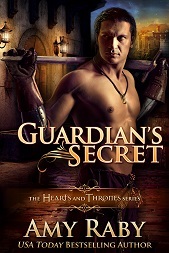 This entry was posted in Books, Fantasy, History and tagged books, fantasy, history, regency, swordspoint. Bookmark the permalink. Ooh, I’m intrigued. Might have to check this out. It’s lovely. The romance is deliciously twisted at times, and the writing is exquisite.